A charming front porch and twin dormers create curb appeal for this country home. The great room is separate from other gathering areas yet connected to the kitchen by the dining room. Creating a centerpiece for the common areas, the octagonal dining room is surrounded by windows and crowned with a tray ceiling. 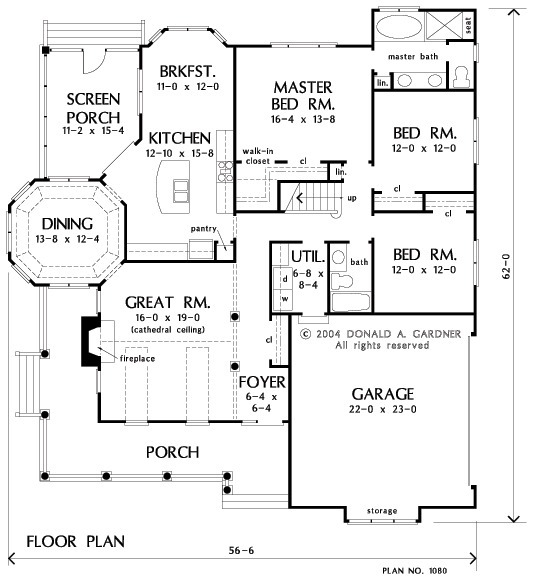 1st Floor: 1939 Sq. Ft. 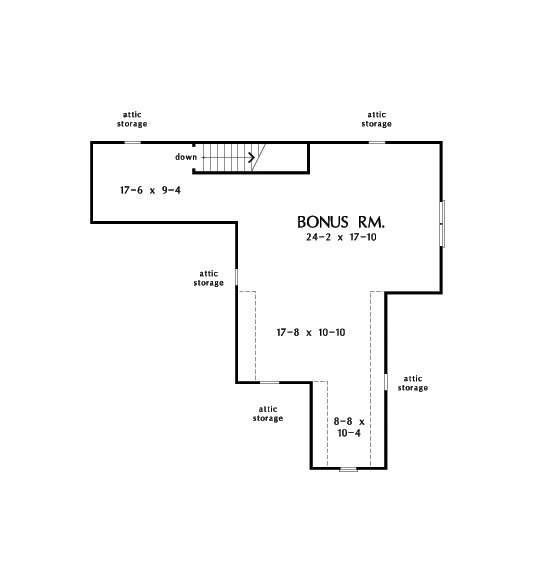 Bonus Room: 876 Sq. 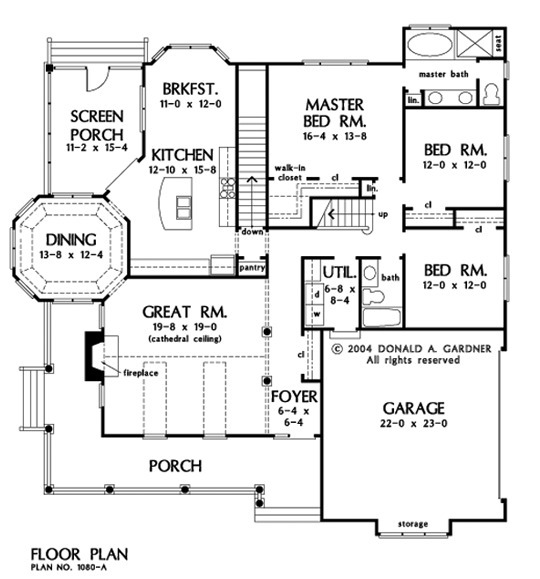 Ft.
House Dimensions: 56' 6" x 62' 0"
Foyer : 6' 4" x 6' 4" x 9' 0"
Dining Room (Tray): 13' 8" x 12' 4" x 10' 6"
Great Room (Vaulted): 16' 0" x 19' 0" x 16' 10"
Kitchen : 12' 10" x 15' 8" x 9' 0"
Breakfast Room : 11' 0" x 12' 0" x 9' 0"
Utility Room : 6' 8" x 8' 4" x 9' 0"
Bonus Room : 24' 4" x 17' 10" x 8' 0"
Garage : 22' 0" x 23' 0" x 9' 0"
Garage Storage : 8' 8" x 1' 8" x 0' 0"
Master Bedroom : 16' 4" x 13' 8" x 9' 0"
Porch - Front : 30' 0" x 7' 0" x 9' 0"
Porch - Left : 7' 0" x 16' 6" x 9' 0"
Porch - Screen : 11' 2" x 15' 4" x 9' 0"